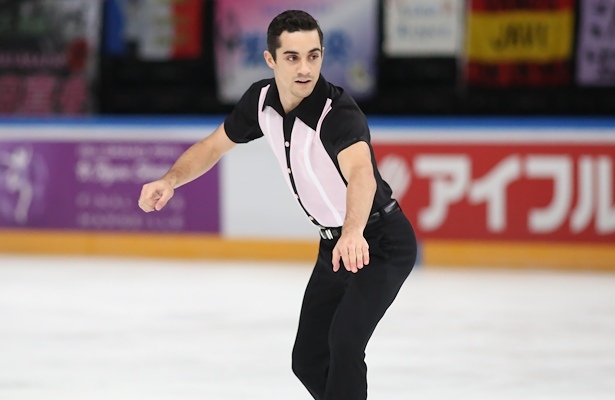 Javier Fernandez of Spain performs his long program at 2016 Trophée de France. Spain’s Javier Fernandez won his second Grand Prix gold medal in what was a strong Men’s competition at 2016 Trophee de France in Paris today. The silver and bronze medals went to Denis Ten of Kazakhstan and USA’s Adam Rippon. Fernandez led after the short despite falling on the quad toe, however, he reacted quickly and switched his combination to the Salchow. In his entertaining “Elvis Presley” long program, the two-time World champion nailed three quads, but fell on a triple Axel and doubled a flip. Nevertheless, he scored 285.38 overall to easily win the gold. Ten has struggled with numerous injuries over the years and also had to withdraw from Skate America. His practices were on and off in Paris, but the Olympic bronze medalist did it when it counted, which is in the program. He turned in two clean performances, with one quad toe each, to take the second Grand Prix medal of his career (269.26). Ten is now training mostly with Nikolai Morozov and obviously enjoys the new input. The short program is a modern arrangement of Romeo and Juliet by Prokofiev, while the long is the classical Tosca, and both were skated with emotion and expression. When Rippon landed his first quadruple toe in competition in his free skate, it was a big step for him. The U.S. Champion did not lose his concentration and went on to hit eight triples, including two Axels, in his program to “The Arrival of the Birds” from the Crimson Wings soundtrack and “O” by Coldplay. The reward was a new personal best of 182.28 points in the long program, as well as overall (267.53). Rippon, who celebrated his 27th birthday on Friday, also was strong in the short which was clean, but without a quad attempt. In the short, the Skate America bronze medalist was ranked fourth, but he jumped onto the podium on Saturday, giving himself an extra little birthday present. “I feel like a huge weight is off my back landing the quad today,” he said. “So nobody can say that I never landed it. And it wouldn’t be Rippon if there weren’t some fun comments. “The whole time I was skating, I was wondering if the pigeon that lives in this arena was going to come out. I saw it yesterday during the ladies’ short program and I thought, that pigeon better fly during my program, but no pigeon, just me,” he said. The pigeons in the rink at Bercy are legendary. They are known for even sitting on the ice during performances. Even though the building was completely renovated, the pigeons are still there. They didn’t seem to enjoy the Men’s event, but came back to fly throughout the rink during the Ladies competition. USA’s Nathan Chen again went for five quads. He landed the Lutz (with a triple toe for combination), the flip, and a toe (with his hand down), but fell on another toe and the Salchow. However, skating is not only about quads and the component score suffered as Chen was focused on the jumps and so he slipped from second to fourth (264.80). In the short, the 2015-16 Junior Grand Prix Final champion had landed the quad Lutz and flip as well. Japan’s Takahito Mura finished fifth (248.42) and Belgium’s Jorik Hendrickx came sixth (230.47).